At last decided to get Luigi mapped. Standard it had 74.5 bhp and 101.2 lb/ft of torque. On my normal M1/M25 commute of 58 miles if I stayed at 60mph and 50mph for the roadworks I could get 83 mpg on the dash readout. 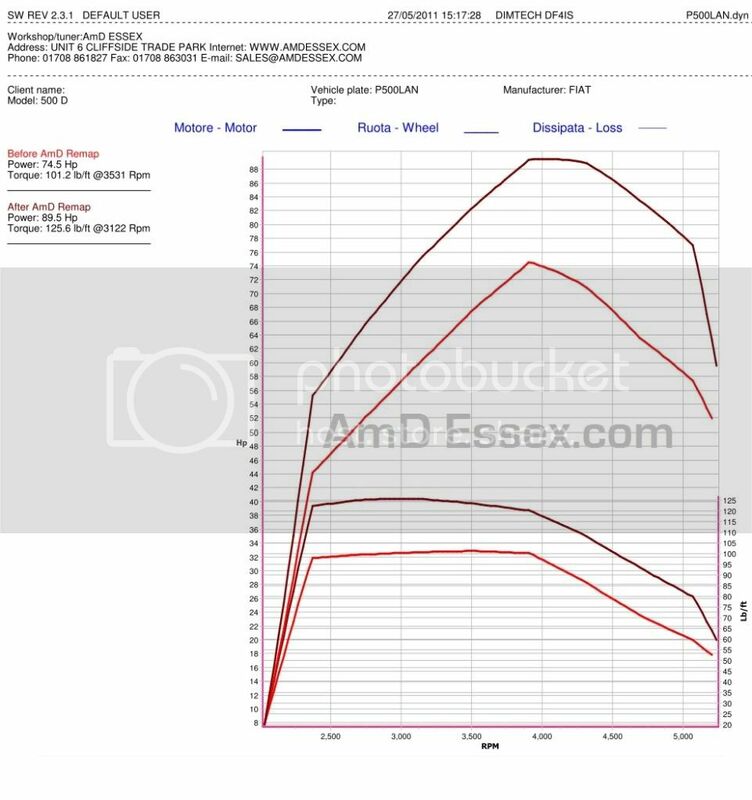 After mapping it now has 90bhp and 126 lb/ft of torque. Not massive figures but it feels much much more responsive and pulls a lot better lower down the rev range. At motorway speeds it also pulls a lot better and copes with longer hills without losing to much speed. Top speed on my private runway has increased by approx 10 mph too. But more impresively, doing the commute at 60 mph, I achieved 92 mpg this morning. So anyone thinking of getting it done I would highly recommend it both for performance and economy. Thanks for posting the RR graph and the pics. Your Luigi looks a sporty number. Excellent mpg figs and it's good to see that the extra boost gives it the extra 'lift' on the motorway. I guess there will be no test pilots in your MJ ! Only thing I'd warn about is the clutch and gearbox. Some people in the Panda forum have had their MJ's remapped and it's ended in pain sadly. 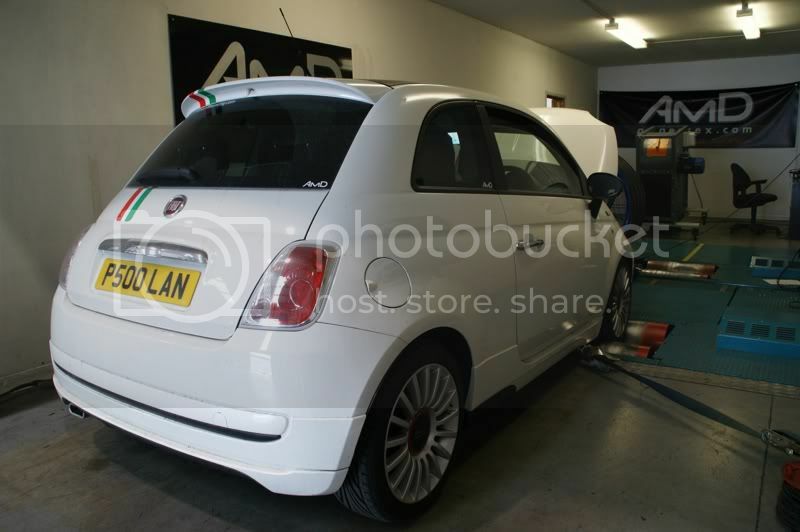 Is that the Abarth rear spoiler? Clutch and gearbox will be fine with the extra power. 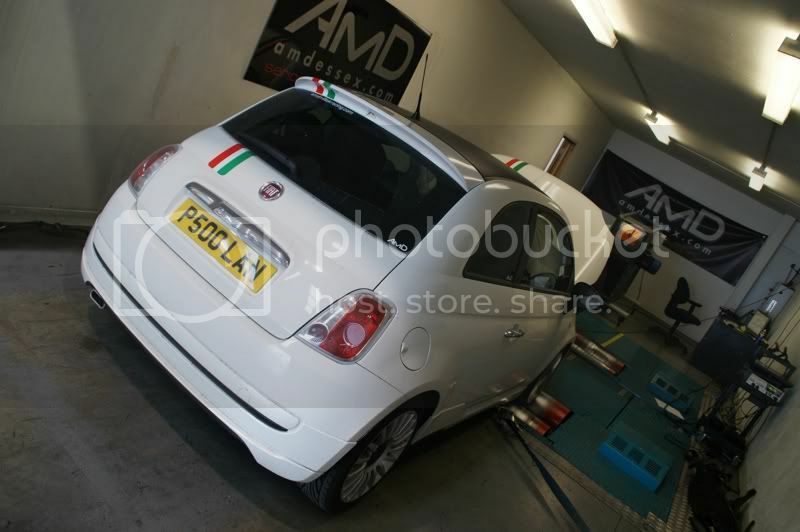 The spoiler is standard, its the Sport model with a Fiat 500 body kit. Front spoiler, side skirts and rear diffuser. It has also been lowered on KW springs. Ah Dunno why I thought it was the Abarth one. As I said before I wouldn't be so sure about the box and clutch, the Panda has the same box and clutch IIRC and they seem to be quite near their limits judging by the issues people are having in there. Linky. Lewey is a very knowledgeable guy and if the 95bhp 500 uses a different box then it does so for good reason. 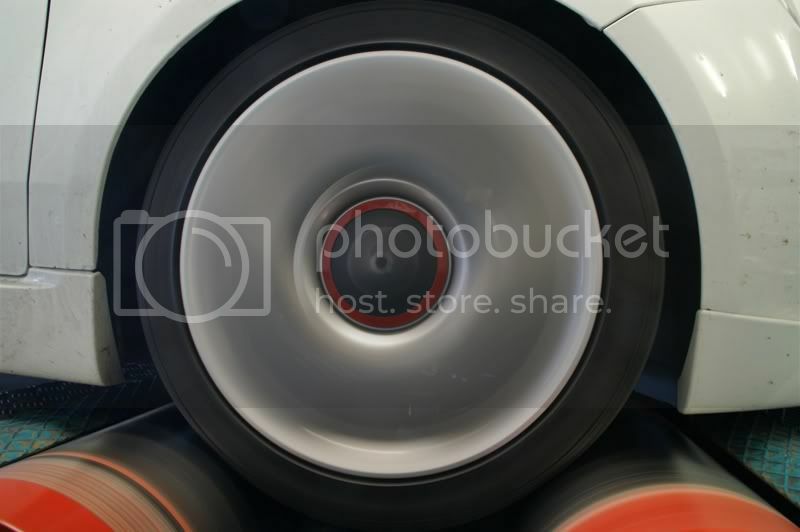 Last edited by 306maxi; 31-05-2011 at 19:41. Having just read the thread I see that the car was not mapped but fitted with a tunning box. A tunning just fools the ECU with a few resistors and puts loads of fuel in with no control. A re map changes lots of parameters and adjusts the fuel accordingly through out the rev range. Some maps are written to deliver limit power/torque in 1st & 2nd gears to help drivability. Last edited by ianrm; 31-05-2011 at 21:24. Having just read the thread I see that the car was not mapped but fitted with a tunning box. A tunning just fools the ECU and puts loads of fuel in with no control. A re map changes lots of parameters and adjusts the fuel accordingly through out the rev range. With some maps they can be written to deliver less power/torque in 1st & 2nd gears to aid drivability. I don't tend join in the Traffic light GP but do use the car although I am mechanically sympathetic in my driving style. The car has just passed 60k miles and has been fine so far apart from the exhaust manifold having a couple of nuts come loose, fixed under warranty and a leak from the rad which I had replaced on holiday in Italy. My other car a 300bhp VX220 did however need a new clutch after running around with 240bhp for a few years. Originally it was 197bhp. Is there a link for these guys? My understanding is that the gearbox on the MJ I is the C154 ? gearbox rated for 150Nm. The standard output of 75bhp and 145Nm is just below what the gearbox was rated for. If you have increased power to 90bhp surely you now way past the tolerances that the gearbox was designed for. Even if you uprate the clutch for the extra power the whole powertrain would still be under stress. Would you not need the uprated C510? gearbox from the multijet II for this 'upgrade' ? I haven't posted on here for a while and did not realise it was so long ago that Luigi was mapped. Well he has now past 120 000 miles since I purchased him new. He is still on the original clutch and has had no problems. It goes to show that if you tune a car, yet drive it with mechanical sympathy, it WILL last. Very few cars are 'under engineered' these days, the testing process of most is very brutal. I have it on pretty good authority that Honda, for example, test how well an engine will cope with a lack of oil. They often run an engine with 200cc of oil (i.e. the bare minimum to cover the pick up), and keep grinding 'softer and softer' (i.e. less lift/duration) cams until the engine will run under the equivalent of many thousands of miles thrashing up motorways. If the lift/duration has to be reduced too much, then its back to the drawing board to find out what's failed, in conjunction with tribologists etc. If you drive like a complete twit you'll break a standard car, but with care, very high power outputs will often be sustained. Good to see that the mpg still keeps around the same figures, exactly what i am after, more response from the engine but whilst saving ££ at the tank. I still can't get my head round why people use tuning boxes though!? Remaps are personal to the car, rather than a box which will pump in to the engine what ever its been set to as standard. AMDEssex... I will look into them! Thanks Ian!